5.1 Humans, including evangelists, calling Jesus "Son of God"
5.2 Jesus calling himself "Son of God"
5.5 Angels calling Jesus "Son of God"
5.6 Satan or demons calling Jesus "Son of God"
5.7 Jesus called "the Son"
5.8 God called "the God and Father of Jesus"
Emperor Constantine and the Fathers of the First Council of Nicaea of 325 with the Niceno–Constantinopolitan Creed of 381. Through the centuries, the theological development of the concept of Son of God has interacted with other Christological elements such as pre-existence of Christ, Son of man, the hypostatic union, etc. For instance, in Johannine "Christology from above" which begins with the pre-existence of Christ, Jesus did not become Son of God through the virgin birth, he always was the Son of God. The term "Son of God" is also found as a small fragment along with other Dead Sea Scrolls, numbered as 4Q246. Early Christians developed various view of how Jesus related to God and what role he played in God's plan for salvation. By the 2nd century, differences had developed among various Christian groups and to defend the mainstream view in the early Church, St. Irenaeus introduced the confession: "One Christ only, Jesus the Son of God incarnate for our salvation". By referring to incarnation, this professes Jesus as the pre-existing Logos, i.e. The Word. It also professes him as both Christ and the only-begotten Son of God. "...in one Lord Jesus Christ, the Son of God, the only-begotten of his Father, of the substance of the Father, God of God, Light of Light, very God of very God, begotten, not made, being of one substance with the Father." Christ Jesus, the Son of God, is God and Man: God before all worlds, man in our world.... But since he is the only Son of God, by nature and not by grace, he became also the Son of Man that he might be full of grace as well. However, unlike Son of God, the proclamation of Jesus as the Son of man has never been an article of faith in Christianity. The interpretation of the use of "the Son of man" and its relationship to Son of God has remained challenging and after 150 years of debate no consensus on the issue has emerged among scholars. Just as in Romans 10:9–13 Paul emphasized the salvific value of "professing by mouth" that Jesus is Lord (Kyrion Iesoun), Augustine emphasized the value of "professing that Jesus is the Son of God" as a path to salvation. For St. Thomas Aquinas (who also taught the Perfection of Christ), the "'Son of God' is God as known to God". Aquinas emphasized the crucial role of the Son of God in bringing forth all of creation and taught that although humans are created in the image of God they fall short and only the Son of God is truly like God, and hence divine. Of all the Christological titles used in the New Testament, Son of God has had one of the most lasting impacts in Christian history and has become part of the profession of faith by many Christians. In the mainstream Trinitarian context the title implies the divinity of Jesus as part of the Trinity of Father, Son and the Spirit. The New Testament quotes Psalm 110 extensively as applying to the son of god. A new theological understanding of Psalm 110:1 and 110:4, distinct from that of Judaism, evolved. Jesus himself quotes Psalm 110 in Luke 20:41-44, Matthew 22:41-45 and Mark 12:35-37.:211 The meanings and authenticity of these quotations are debated among modern scholars. :204 Various modern critical scholars reject that David wrote this psalm. In the Masoretic Text many Psalm including this one are explicitly attributed to David. The superscription is "of David a psalm." Some have suggested that this indicates that Psalm 110 was not written by David. The superscription as it stands is ambiguous. However, Jewish tradition ascribes Psalm 110 and indeed all Psalms to king David. :314–315 In Christianity David is consider to be a prophet. The New Testament records several psalms as having been spoken through David by the Holy Spirit. Acts 2:29-30 explicitly calls David a prophet. Jesus himself affirms the authorship of this psalm by David in Mark 12:36 and Matthew 22:43.:314–315 In the Christian reading, David the king is presented as having a lord other than the Lord God. The second lord is the Messiah, who is greater than David, because David calls him "my lord". :371–373 In Hebrew, the first "Lord" in Psalm 110 is "Yahweh" (יהוה), while the second is referred to as "adoni" (אדני), (my adon), a form of address that in the Old Testament is used generally for humans but also, in Judges 6:13, for the theophanic Angel of the Lord. :319 The Greek-speaking Jewish philosopher Philo, a contemporary of Jesus, identified the Angel of the Lord with his version of the logos distinct from the later Christian logos. He said to me, "You are my son; today I have begotten you. Ask of me, and I will make the nations your heritage, and the ends of the earth your possession. You shall break them with a rod of iron, and dash them in pieces like a potter's vessel." The terms "sons of God" and "son of God" appear frequently in Jewish literature, and leaders of the people, kings and princes were called "sons of God". What Jesus did with the language of divine sonship was first of all to apply it individually (to himself) and to fill it with a meaning that lifted "Son of God" beyond the level of his being merely a human being made like Adam in the image of God, his being perfectly sensitive to the Holy Spirit (Luke 4:1, 14, 18), his bringing God's peace (Luke 2:14; Luke 10:5–6) albeit in his own way (Matt 10:34, Luke 12:51), or even his being God's designated Messiah. In the New Testament, the title "Son of God" is applied to Jesus on many occasions. It is often used to refer to his divinity, from the beginning of the New Testament narrative when in Luke 1:32–35 the angel Gabriel announces: "the power of the Most High shall overshadow thee: wherefore also the holy thing which is begotten shall be called the Son of God." The declaration that Jesus is the Son of God is echoed by many sources in the New Testament. On two separate occasions the declarations are by God the Father, when during the Baptism of Jesus and then during the Transfiguration as a voice from Heaven. On several occasions the disciples call Jesus the Son of God and even the Jews scornfully remind Jesus during his crucifixion of his claim to be the Son of God." However, the concept of God as the father of Jesus, and Jesus as the exclusive divine Son of God is distinct from the concept of God as the Creator and father of all people, as indicated in the Apostle's Creed. The profession begins with expressing belief in the "Father almighty, creator of heaven and earth" and then immediately, but separately, in "Jesus Christ, his only Son, our Lord", thus expressing both senses of fatherhood within the Creed. The Gospel of Mark begins by calling Jesus the Son of God and reaffirms the title twice when a voice from Heaven calls Jesus: "my Son" in Mark 1:11 and Mark 9:7. In Matthew 14:33 after Jesus walks on water, the disciples tell Jesus: "You really are the Son of God!" In response to the question by Jesus, "But who do you say that I am? ", Peter replied: "You are Christ, the Son of the living God". And Jesus answered him, "Blessed are you, Simon Bar-Jonah! For flesh and blood has not revealed this to you, but my Father who is in heaven" (Matthew 16:15–17). In Matthew 27:43, while Jesus hangs on the cross, the Jewish leaders mock him to ask God help, "for he said, I am the Son of God", referring to the claim of Jesus to be the Son of God. Matthew 27:54 and Mark 15:39 include the exclamation by the Roman commander: "He was surely the Son of God!" after the earthquake following the Crucifixion of Jesus. In Luke 1:35, in the Annunciation, before the birth of Jesus, the angel tells Mary that her child "shall be called the Son of God". In Luke 4:41 (and Mark 3:11), when Jesus casts out demons, they fall down before him, and declare: "You are the Son of God." In John 1:34 John the Baptist bears witness that Jesus is the Son of God and in John 11:27 Martha calls him the Messiah and the Son of God. In several passages in the Gospel of John assertions of Jesus being the Son of God are usually also assertions of his unity with the Father, as in John 14:7–9: "If you know me, then you will also know my Father" and "Whoever has seen me has seen the Father". In John 19:7 the Jews cry out to Pontius Pilate "Crucify him" based on the charge that Jesus "made himself the Son of God." The charge that Jesus had declared himself "Son of God" was essential to the argument of the Jews from a religious perspective, as the charge that he had called himself King of the Jews was important to Pilate from a political perspective, for it meant possible rebellion against Rome. Towards the end of his Gospel (in 20:31) John declares that the purpose for writing it was "that you may believe that Jesus is the Messiah, the Son of God". In Acts 9:20, after the Conversion of Paul the Apostle, and following his recovery, "straightway in the synagogues he proclaimed Jesus, that he is the Son of God." According to the Synoptic Gospels, Jesus referred to himself obliquely as "the Son" and even more significantly spoke of God as "my Father" (Matt. 11:27 par. ; 16:17; Luke 22:29). He not only spoke like "the Son" but also acted like "the Son" in knowing and revealing the truth about God, in changing the divine law, in forgiving sins, in being the one through whom others could become children of God, and in acting with total obedience as the agent for God's final kingdom. This clarifies the charge of blasphemy brought against him at the end (Mark 14:64 par. ); he had given the impression of claiming to stand on a par with God. Jesus came across as expressing a unique filial consciousness and as laying claim to a unique filial relationship with the God whom he addressed as "Abba". Even if historically he never called himself "the only" Son of God (cf. John 1:14, 18; John 3:16, 18), Jesus presented himself as Son and not just as one who was the divinely appointed Messiah (and therefore "son" of God). He made himself out to be more than only someone chosen and anointed as divine representative to fulfil an eschatological role in and for the kingdom. Implicitly, Jesus claimed an essential, "ontological" relationship of sonship towards God which provided the grounds for his functions as revealer, lawgiver, forgiver of sins, and agent of the final kingdom. Those functions (his "doing") depended on his ontological relationship as Son of God (his "being"). Jesus invited his hearers to accept God as a loving, merciful Father. He worked towards mediating to them a new relationship with God, even to the point that they too could use "Abba" when addressing God in prayer. Yet, Jesus' consistent distinction between "my" Father and "your" Father showed that he was not inviting the disciples to share with him an identical relationship of sonship. He was apparently conscious of a qualitative distinction between his sonship and their sonship which was derived from and depended on his. His way of being son was different from theirs. In the Gospel of John, Jesus is the eternally pre-existent Son who was sent from heaven into the world by the Father (e.g., John 3:17; John 4:34; John 5:24–37). He remains conscious of the divine pre-existence he enjoyed with the Father (John 8:23, John 8:38–42). He is one with the father (John 10:30; John 14:7) and loved by the Father (John 3:35; John 5:20; John 10:17; John 17:23–26). The Son has the divine power to give life and to judge (John 5:21–26; John 6:40; John 8:16; John 17:2). Through his death, resurrection, and ascension the Son is glorified by the Father (John 17:1–24), but it is not a glory that is thereby essentially enhanced. His glory not only existed from the time of the incarnation to reveal the Father (John 1:14), but also pre-existed the creation of the world (John 17:5-7-24). Where Paul and the author of Hebrews picture Jesus almost as the elder brother or the first-born of God's new eschatological family (Rom 8:14–29; Heb 2:10–12), John insists even more on the clear qualitative difference between Jesus' sonship and that of others. Being God's "only Son" (John 1:14–1:18; John 3:16–3:18), he enjoys a truly unique and exclusive relationship with the Father. At least four of these themes go back to the earthly Jesus himself. First, although one has no real evidence for holding that he was humanly aware of his eternal pre-existence as Son, his "Abba-consciousness" revealed an intimate loving relationship with the Father. The full Johannine development of the Father-Son relationship rests on an authentic basis in the Jesus-tradition (Mark 14:36; Matt. 11:25–26; 16:17; Luke 11:2). Second, Jesus not only thought of himself as God's Son, but also spoke of himself as sent by God. Once again, John develops the theme of the Son's mission, which is already present in sayings that at least partly go back to Jesus (Mark 9:37; Matt 15:24; Luke 10:16), especially in 12:6, where it is a question of the sending of a "beloved Son". Third, the Johannine theme of the Son with power to judge in the context of eternal life finds its original historical source in the sayings of Jesus about his power to dispose of things in the kingdom assigned to him by "my Father" (Luke 22:29–30) and about one's relationship to him deciding one's final destiny before God (Luke 12:8–9). Fourth, albeit less insistently, when inviting his audience to accept a new filial relationship with God, Jesus — as previously seen — distinguished his own relationship to God from theirs. The exclusive Johannine language of God's "only Son" has its real source in Jesus' preaching. All in all, Johannine theology fully deploys Jesus' divine sonship, but does so by building up what one already finds in the Synoptic Gospels and what, at least in part, derives from the earthly Jesus himself. 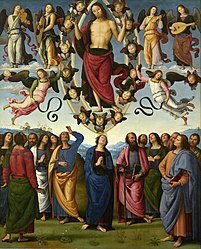 The Ascension, Jesus returning to his Father – by Pietro Perugino (c.1500), Musée des Beaux-Arts de Lyon. In their own way, John and Paul maintained this distinction. Paul expressed their new relationship with God as taking place through an "adoption" (Gal. 4:5; Rom. 8:15), which makes them "children of God" (Rom. 8:16–17) or, alternatively, "sons of God" (Rom. 8:14; (Rom. 4:6–7). John distinguished between the only Son of God (John 1:14, 18; John 3:16, 18) and all those who through faith can become "children of God" (John 1:12; 11:52; and 1 John 3:1–2,10 1 John 5:2). Paul and John likewise maintained and developed the correlative of all this, Jesus' stress on the fatherhood of God. Over 100 times John's Gospel names God as "Father". Paul's typical greeting to his correspondents runs as follows: "Grace to you and peace from God our Father and the/our Lord Jesus Christ" (Rom 1:7; 1 Cor 1:3; 2 Cor 1:2; Gal 1:3; Phil 1:2; 2 Thess 1:2; Philem 3). The greeting names Jesus as "Lord", but the context of "God our Father" implies his sonship. There is one God, the Father, from whom are all things and for whom we exist, and one Lord, Jesus Christ, through whom are all things and through whom we exist. Calling God "the Father" clearly moves one toward talk of "the Son". In the case of Colossians 1:16, the whole hymn (Col. 1:15–20) does not give Jesus any title. However, he has just been referred to (Col. 1:13) as God's "beloved Son". Third, it should be observed that the language of "sending" (or, for that matter, "coming" with its stress on personal purpose (Mark 10:45 par. ; Luke 12:49, 51 par.) by itself does not necessarily imply pre-existence. Otherwise one would have to ascribe pre-existence to John the Baptist, "a man sent from God", who "came to bear witness to the light" (John 1:6–8; cf. Matt. 11:10, 18 par.). In the Old Testament, angelic and human messengers, especially prophets, were "sent" by God, but one should add at once that the prophets sent by God were never called God's sons. It makes a difference that in the cited Pauline passages it was God's Son who was sent. Here being "sent" by God means more than merely receiving a divine commission and includes coming from a heavenly pre-existence and enjoying a divine origin. Fourth, in their context, the three Son of God passages here examined (Rom. 8:3, 32; Gal. 4:4) certainly do not focus on the Son's pre-existence, but on his being sent or given up to free human beings from sin and death, to make them God's adopted children, and to let them live (and pray) with the power of the indwelling Spirit. Nevertheless, the Apostle's soteriology presupposes here a Christology that includes divine pre-existence. It is precisely because Christ is the pre-existent Son who comes from the Father that he can turn human beings into God's adopted sons and daughters. When in Matthew 16:15–16, Saint Peter states: "You are Christ, the Son of the living God", Jesus not only accepts the titles, but calls Peter "blessed" because his declaration had been revealed him by "my Father who is in Heaven". According to John Yieh, in this account the evangelist Matthew is unequivocally stating this as the church's view of Jesus. In the Sanhedrin trial of Jesus in Mark 14:61 when the high priest asked Jesus: "Are you the Messiah, the Son of the Blessed One?" In the next verse, Jesus responded "I am". Jesus' claim here was emphatic enough to make the high priest tear his robe. In Matthew 11:27 Jesus claims a direct relationship to God the Father: "No one knows the Son except the Father and no one knows the Father except the Son", asserting the mutual knowledge he has with the Father. In John 5:23 he claims that the Son and the Father receive the same type of honor, stating: "so that all may honor the Son, just as they honor the Father". In John 5:26 he claims to possess life as the Father does: "Just as the Father has life in himself, so also he gave to his Son the possession of life in himself". In a number of other episodes Jesus claims sonship by referring to the Father, e.g. in Luke 2:49 when he is found in the temple a young Jesus calls the temple "my Father's house", just as he does later in John 2:16 in the Cleansing of the Temple episode. In Matthew 1:11 and Luke 3:22 Jesus allows himself to be called the Son of God by the voice from above, not objecting to the title. References to "my Father" by Jesus in the New Testament are distinguished in that he never includes other individuals in them and only refers to his Father, however when addressing the disciples he uses your Father, excluding himself from the reference. In numerous places in the New Testament, Jesus is called the Son of God by various parties. Humans, including evangelists, calling Jesus "Son of God"
Jesus calling himself "Son of God"
Angels calling Jesus "Son of God"
Satan or demons calling Jesus "Son of God"
God called "the God and Father of Jesus"
The New Testament also contains six references to God as "the God and Father" of Jesus. ^ Jerome H. Neyrey (2009). [hhttps://books.google.com/books?id=X0JZ9uSc8SoC&pg=PA314 The Gospel of John in Cultural and Rhetorical Perspective]. Wm. B. Eerdmans Publishing. pp. 313–316. ISBN 9780802848666. ^ James Limburg (2000). Psalms: Westminster Bible companion. Westminster John Knox Press. p. 380. ISBN 9780664255572. Retrieved 29 April 2014. ^ Susan Gillingham (2008). Psalms Through the Centuries. John Wiley & Sons. p. 86. ISBN 9780470691083. Retrieved 29 April 2014. ^ Walter de Gruyter (2010). Abraham and Melchizedek: Scribal Activity of Second Temple Times in Genesis 14 and Psalm 110, Volume 23. Walter de Gruyter GmbH & Co. pp. 196–198. ISBN 9783110223453. Retrieved 5 February 2014. ^ Doron Mendels (1997). The Rise and Fall of Jewish Nationalism. Wm. B. Eerdmans Publishing. p. 76. ISBN 9780802843296. Retrieved 8 February 2014. ^ Scott Hahn (2009). Kinship by Covenant: A Canonical Approach to the Fulfillment of God's Saving Promises. Yale University Press. p. 193. ISBN 0300140975. Retrieved 8 February 2014. ^ Allan Russell Juriansz (2013). King David's Naked Dance: The Dreams, Doctrines, and Dilemmas of the Hebrews. iUniverse. pp. 4–6. ISBN 9781475995688. Retrieved 8 February 2014. ^ William J. Dumbrell (2002). The Faith of Israel: A Theological Survey of the Old Testament. Baker Academic. ISBN 9781585584963. Retrieved 2 February 2014. ^ Matthias Henze (2011). Hazon Gabriel. Society of Biblical Lit. Retrieved 2 April 2014. ^ Placher, William Carl (1988). "The Trinitarian and Christological Controversies". Readings in the History of Christian Theology. 1: From Its Beginnings to the Eve of the Reformation. Louisville, Kentucky: Westminster John Knox Press. pp. 52–53. ISBN 9780664240578. Retrieved 22 June 2016. ^ a b c d e f Aquila H. I. Lee (2009). From Messiah to Preexistent Son. Wipf and Stock Publishers. ISBN 9781606086308. Retrieved 30 April 2014. ^ a b Flint, Peter W; Jr Miller, Patrick D; Brunell, Aaron; Roberts, Ryan (2005). Peter W. Flint, Patrick D. jr Miller, Aaron Brunell, Ryan Roberts (editors), The Book of Psalms: Composition and Reception, Volume 99 (BRILL 2005 ISBN 978-90-0413642-7), p. 53. ISBN 9004136428. Retrieved 7 October 2014. ^ James L. Kugel, ed. (1990). Poetry and Prophecy: The Beginnings of a Literary Tradition. Cornell University Press. p. 45. ISBN 0801495687. Retrieved 3 May 2014. ^ "Brown-Driver-Briggs Hebrew and English Lexicon of the Old Testament". Retrieved 7 October 2014. ^ Matthew V. Novenson (2012). Christ Among the Messiahs: Christ Language in Paul and Messiah Language in Ancient Judaism. Oxford University Press. pp. 145–146. ISBN 9780199844579. Retrieved 29 April 2014. ^ Ronald E. Heine (2007). Reading the Old Testament with the Ancient Church (Evangelical Ressourcement): Exploring the Formation of Early Christian Thought. Baker Academic. pp. 132–133. ISBN 9781441201539. Retrieved 1 May 2014. ^ a b c d e f "Catholic Encyclopedia: Son of God". Retrieved 7 October 2014. ^ a b c d e f g h For this subsection and the themes treated hereinafter, compare Gerald O'Collins, Christology: A Biblical, Historical, and Systematic Study of Jesus. Oxford:Oxford University Press (2009), pp. 130–140; cf. also J. D. G. Dunn, The Theology of Paul the Apostle, Edinburgh: T&T Clark (1998), pp. 224ff. ; id., Christology in the Making, London: SCM Press (1989), passim; G.D. Fee, Pauline Christology: An Exegetical-Theological Study, Peabody, Mass. : Hendrickson (2007), pp. 508–557; A.C. Thiselton, The First Epistle to the Corinthians, Grand Rapids, Mich.: Eedermans (2000), pp. 631–638. ^ It should be noted that Jesus' (human) consciousness of such divine sonship is one thing, whereas such (human) consciousness of divine pre-existence would be quite another thing. Cf. Byrne, loc. cit. ^ Cf. J.D.G. Dunn, The Theology of Paul the Apostle, cit., pp. 224–225, 242–244, 277–278; Fee, Pauline Christology, cit., pp. 508–512, 530–557. ^ For the implications of Corinthians, cf. A. C. Thiselton, The First Epistle to the Corinthians, cit., pp. 631–638. ^ Other Son of God passages in Paul centre on the crucifixion and resurrection of Jesus and their (immediate and final) salvific consequences. Cf. int. al., Rom. 5:10, 1 Cor. 1:9, Rom. 8:14–17, Gal. 4:6–7. ^ Charles H. H. Scobie The ways of our God: an approach to biblical theology 2003 ISBN 0-8028-4950-4 p. 136 "God is "the God and Father of our Lord Jesus Christ" (Rom 15:6; Eph 1:3), but also the Father of all believers (cf. Bassler 1992: 1054–55). Clearly this derives from the usage and teaching of Jesus himself."